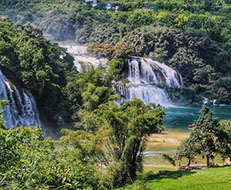 Hanoi, Hagiang, Quan Ba, Dong Van, Meo Vac, Ba Be Lake, Cao Bang, Ban Gioc Waterfall, Lang Son, Bai Tu Long Bay, Halong Bay, Ninh Binh, Te Village. We depart Hanoi at 7:15 to 7:30 from your hotel and our first stop is at the tiny village in Thung Uyen, home to Dao and H’mong people. This offers us ample opportunities to meet the locals going about their way of life. As the day progresses, we drive to various walking trails surrounded by magical hills and beautiful villages. 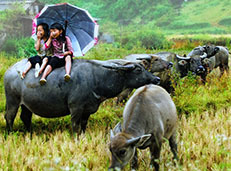 Around sunset, we arrive at the township of Ha Giang. Here we have some free time to capture the tranquil pace of life before our dinner is prepared in a local family. After dessert we retire to our cosy and friendly local family for a good night’s rest. (Breakfast, lunch and dinner are included). The hike for today is through remote and beautiful countryside of Quan Ba and Dong Van where we pass through several villages along tracks used by the local people. 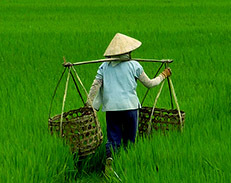 We are rewarded with a brilliant backdrop of picturesque valleys covered in rice paddies. 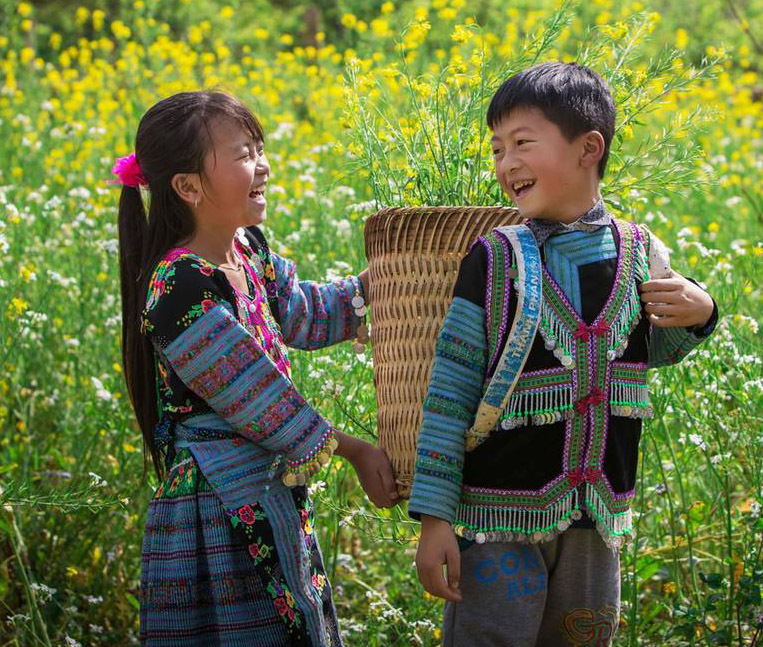 The H’mong and Hoa people, who are the local ethnic minorities, exhibit their friendliness through their colorful clothing and warm hospitality. The night is spent in a hotel in Dong Van. (Breakfast, lunch and dinner are included). This morning we hike up through rugged outcrops to the beautiful town of Meo Vac. 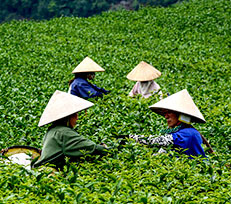 Set among towering mountains, Meo Vac is home to some H’mong and Hoa farming families. The scenery up here is breathtakingly beautiful. As the sun sets, we descend due to the township of Meo Vac for the night in the hotel. (Breakfast, lunch and dinner are included). We depart Meo Vac and embark on a route up into mountain areas onwards to Bao Lac then onto Ba Be Lake. En route we take a hike around villages and meet the local people. The night is spent in a local family. (Breakfast, lunch and dinner are included). 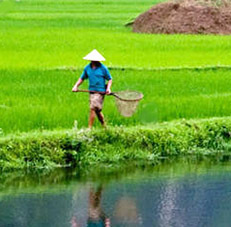 Ba Be Lake is one of the largest natural lakes in Vietnam, home to many kinds of birds, scenic valleys, towering rocky outcrops, underground river tributaries, and a gigantic cave. All of the villages in the park are not necessarily ethnic Tay. Those located high up on the slopes are inhabited by Green H’mong and Red Dao hill tribal people. 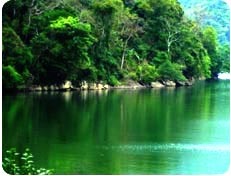 The scenery is extraordinary, with rural farmland and rugged mountains jutting out of the tangled jungle growth. We end our day back to our host for the night. (Breakfast, lunch and dinner are included). Today we enjoy a beautiful boat ride along the lake. This followed by a scenic drive through rugged mountains to Cao Bang for the night in a hotel. (Breakfast, lunch and dinner are included). We head to the waterfall of Ban Gioc set amidst the beautiful mountains. Here we hike around and appreciate the beauty of the waterfall. Next, we explore Nguom Ngao Cave and hike around beautiful villages before we journey due to north east to the border town of Lang Son. Ha Long Bay and Bai Tu Long Bay of the submerged Dragon boasts 3000 craggy and towering islets and are amongst the most picturesque places in Vietnam. The fantastic beauty of the bays has given rise to many legends, some of them dating back to the ancient past as a dragon descended into the deep water. Departing Lang Son we head for Cai Rong Island. Here, we enjoy a boat trip through spectacular limestone outcrops. Those who are energetic can enjoy a kayak ride around the bay. Upon our arrival on Quan Lan Island, we settle in with a local family lodge for the night. (Breakfast, lunch and dinner are included). We have breakfast and stroll around the stunning visual surroundings of the island. This is followed by a delightful bicycle ride across the island. Later in the morning, we board our boat and explore the extent of the bay. The return journey follows a different route, allowing us a few hours to soak up the transquil beauty only found in Bai Tu Long Bay. Kayaking is one of the best ways to discover a delightful floating fishing village, an example of a way of life where some families spend their life living on the sea. Then onto Cai Rong Island. From here we board our vehicle for a transfer to Halong City. This is followed by our boat trip among some of the spectacular limestone peaks – time to relax and appreciate the sublime beauty of the bay. Well off the tourist trail, we indulge in Hang Trong, a beautiful spot, perfect for the night on our traditional boat. (Breakfast, lunch and dinner are included). We have breakfast and this is followed by a kayaking ride through a magnificent cave, before we continue navigating through the stunning limestone scenery of the bay. There's time to enjoy great food on our bat. 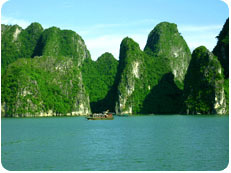 Nothing compares to the misty atmosphere and emerald waters of Halong Bay. We find some fishing villages surrounded by towering rock formations we are warmly welcomed into the home of a fishing family. Returning to Halong City we board our vehicle for a journey to The Red River Delta then onto Yen Mo for the night. (Breakfast, lunch and dinner are included). 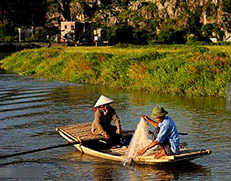 A short transfer brings us to Ninh Xuan with its dramatic limestone mountains, our base for a day trip out into the Red River Delta. 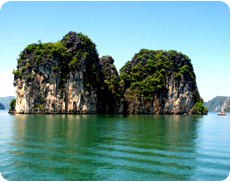 We take a bamboo boat on the peaceful canal which winds its way through amazing limestone outcrops. We cycle past the Inland Ha Long Bay. 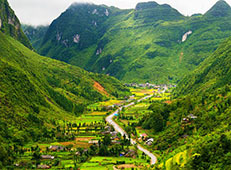 Beautiful landscapes meet us on arrival in the Bich Dong area – a firm favourite with walkers. We settle in with a local family making fresh rice noodles and other dishes that typify Northern Vietnamese cooking – a superb way to gain a first hand experience of rural life in the delta. The night is spent in the same lodge. (Breakfast, lunch and dinner are included). We depart Yen Mo for a drive to Te Village. 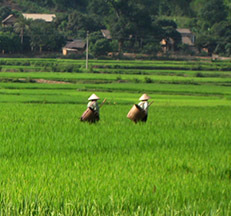 Time permitting we hike around the open rice fields, and idyllic villages in a particularly picturesque part of the area, home to beautiful mountains and rolling hills. 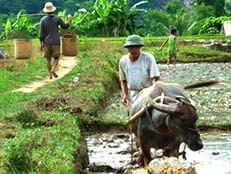 We absorb the daily life and appreciate the warmth and friendliness of the local people we meet along the way. The night is spent in one of the White Thai family. The Thai people are an ethnic minority group originally from southern China and ethnically linked to the Thai in Thailand. We enjoy the warm hospitality over a dinner with the host and an overnight stay in a traditional stilt-house. (Breakfast, lunch and dinner are included). This morning we hike through the forest of Na Mo then descend to the village of Na Meo and Na Meo. We see the villages and people going about their day. In the afternoon, we return to our local family for the night. (Breakfast, lunch and dinner are included). 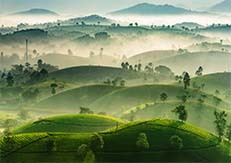 Today we hike through the tiers of splendid rice terraces, past several idyllic villages, verdant hilllocks, lush farmlands and beautiful mountains. Time is also spent cycling through White Thai villages and along mountains and hills. This is followed by our journey to Hanoi, arriving there at about 5pm. (Breakfast and lunch are included). - a 10-15 km hike on Day 3. - a 3-6 km hike on Day 4. - a 3-5 km hike on Day 6. - a 2-3 km hike on Day 7. - a 1-hour bicycling ride and a 1-2 hour kayaking ride on Day 9. - a 1-hour kayaking ride on Day 10. - a 1-2 hour bicycling ride on Day 11. - a 4-6 km hike on Day 12. - a 12-15 km hike on Day 13. - a 8-10 km hike and a 1-2 hour bicycling ride on Day 14. Transport: boat, kayak, bicycle and car (minivan). Tour Guides: all of our experienced and friendly Tour Guides speak fluent English. 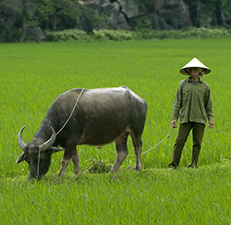 They are extremely knowledgeable about local cultures, history and the environment. Meals: 13 breakfasts, 14 lunches and 13 dinners. 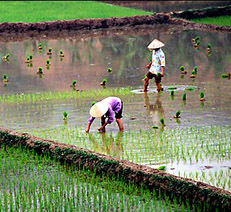 We choose local ingredients, typical of the way people eat in the area, at local restaurants, markets or homes. We also cater for Vegetarians but please request this at time of booking. Accommodation: local families (5 nights), hotels (4 nights), overnight boat (1 night) and lodges (3 nights). 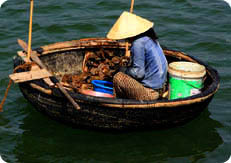 The trip cost: $986USD per person for a group of 4 to 6 people and 10 to 14 people for Bai Tu Long Bay and Halong Bay. The cost of the trip includes: accommodation, transportation, Tour Guide(s), meals listed on the itinerary, admission fees and permits where applicable. The cost of the trip does not include: travel insurance, drinks (soft drinks, alcohol and bottled water) and personal expenses.